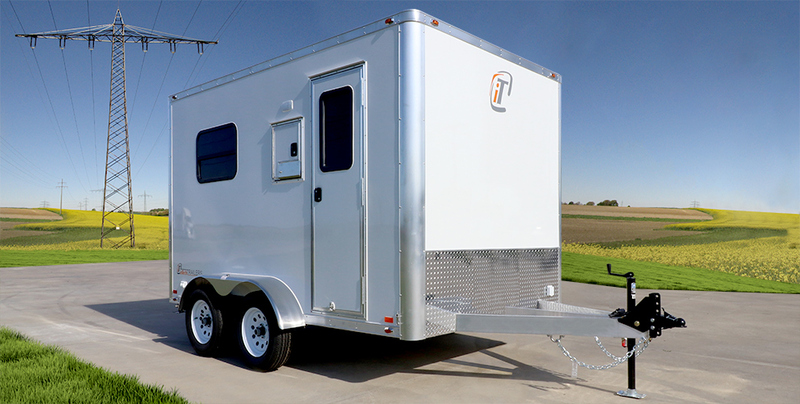 inTech Trailers presents the Fiber Essentials, a fiber optic trailer line. It's built with the same quality and attention to detail as the rest of our trailers, just with the budget-minded client as our focus. We specialize in building rugged and durable fiber optic splicing trailers that are specifically designed for the extreme demands that are seen in this industry. We are certain you will agree inTech Trailers provides the greatest value in a fiber splicing trailer! To learn more about what goes into a Fiber Essentials trailer, check out the video tour! If there is something that you are interested in that you do not see on the list of standard fiber optic trailer features, simply let us know. Our list of options are what are commonly requested but with an engineering staff and custom production facility, we can quote, draw and build your exact configuration. Give us a call today and discover the inTech fiber optic trailer difference! When you buy a new trailer, it of course has a brand new floor and it doesn't really matter what subfloor is used. However, after years of use, all the salt, ice, dirt, water, etc, the type of subfloor used does matter. In order for many flooring materials to be installed properly, a normal, non-treated, plywood must be used for proper absorption of flooring adhesive. Also, most manufacturers simply paint the bottom of the plywood black. This does offer some level of protection for the wood, but after a few years of use, the paint can wear off and allow the weather and road to start to damage the wood. The last thing you want on your new purchase is to have a rotten floor after just a few years of use. At inTech, we put a one-piece aluminum floor above the crossmembers and below the plywood. This gives the plywood a layer of protection from all of the salt, rain, and road debris that you will come across. Because of the extra cost and labor involved in doing this, no other manufacturer offers this technique, even as an option to purchase, but at inTech Trailers, it's our standard. Extra work but higher quality for your hard earned dollar... this is what you should expect from a premium trailer. The roof structure is one of the integral components of your trailer. Having a high quality roof will not only help to keep your cargo dry today, but also give you many more years of worry free ownership. Our roof structure has an arch with a 1" peak. This truss structure allows the water to run off and also gives the roof extra support to handle heavy snow loads. This truss design also enables us to recess interior lighting. By adding a standard walk on roof, we have eliminated dimples in roof metal that can pool water and also strengthens the roof making component installations more secure. Adding or servicing any roof mounted components is also a snap without any worry of causing damage to the roof while working. This is a combination that you would have to pay hundreds or thousands for from other manufacturers, but we do it standard...this is what you should expect from a premium trailer. When you are shopping for a trailer you will find companies that try to cut costs in many different places. One of the most obvious is how often they place their wall, floor, and roof crossmembers. The further apart they can put their crossmembers, the more money they save...but that is the structure of your trailer that they are trying to skimp on. Every inTech Trailer model has crossmembers for walls, ceiling and floor at 16" on center. This makes sure you have a strong base structure and is fundamental to having a trailer that lasts as long as you want it to. Z-channel, hat post, c-channel...these are all ways that other companies save a few dollars in their frames. Using an all tube frame costs more money, but makes a better trailer. A fully enclosed tube provides more strength and rigidity, and that makes your trailer look better and last longer than any other build. inTech Trailers uses all tube construction in the base frame, walls, and ceiling. A trailer that is built better, stronger, and tougher.. this is what you want when you buy your next trailer. inTech Trailers has a screwless exterior standard on all models. It looks more aesthetically pleasing and requires a lot less maintenance for owners than a screwed on or riveted trailer. Just about every manufacturer offers an option for a screwless exterior, at an extra cost, but not all screwless exteriors are created equal. 3M VHB tape is the gold standard that all other companies try to imitate. Many manufacturers use imitation tapes or even worse, caulk adhesives, to attach their sidewall metal. They use it because they can save a couple of dollars in materials and can have a faster installation time, but this can cost the future owner a lot of money and headaches down the road. Even when the right material is used, the proper application method must also be used to ensure proper adhesion. Our quality-minded Amish production staff has years of experience working with VHB and always follow the proper techniques for installing your screwless exterior. A screwless exterior that not only uses the right materials and installation techniques, but is also free... that is the inTech difference. Dexter axles are the name in quality axles and their rubber torsion series is top of the line. EZ lube hubs for easy owner maintenance, combined with parts and service centers available nationwide, make it the only choice for your new trailer. Beware of other companies that try to substitute a less expensive axle or spring axles to save money. If you ever have an issue with your Dexter axles you will be able to get it fixed correctly and fast no matter where you are. Every model that inTech produces has Dexter Torsion Axles with EZ Lube hubs standard to ensure years of worry free use! LED lighting has been a breakthrough in recent years that has provided amazing function and design to many industries. LED lights use less power, last longer, and are more visible than traditional incandescent lights. Although they cost a little more than the old fashion lights, they relieve maintenance worries and add a level of safety to your travels that simply isn't worth pinching a few pennies on. And while many manufacturers still use incandescent lights and charge you for an upgrade, full LED exterior lighting is standard on every trailer that inTech produces. A safer, better product for no extra expense to you, the customer, is what inTech is all about. Larger crews will appreciate the extra space found in the 7x12 tandem axle splicing trailer. A great choice not only for the added space, but the 7’ wide box is still easy to see around when towing to the jobsite. The standard tandem axle design offers added stability at the jobsite helping to decrease worker fatigue. The 7x12 trailer is an exceptional value providing an effective clean room with a great work environment. Click on a stock unit to check out all of the photos, prints and details!